The fix is to update the target version that matches the SQL Server Version. Right click and go to project properties and update the Target Version to match and redeploy the project. And in our destination server where we were had restored and imported the organization, it was 2017. 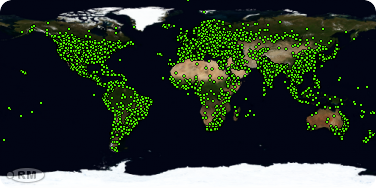 We tried out a few of the things mentioned in the forums, eventually what worked for us was to create a new Report Server database in the Destination server. This created the database with the version expected and our import was successful. It was occurring when we were selecting more than 20 records for deletion. We updated it to its default value 1000 to get this fixed. A nice feature added to the platform ..
Well this has long been awaited for. And how many times I had my customer walking up to me and ask – “I have an existing field. Do CRM provide Autonumber feature? Can I convert an existing text field to AutoNumber field?”. Till this point my answer was Yes but with a suffix“but” in it. However going forward you can with the new entity designer in power apps. So you can select Primary Attribute Number field of your entity and covert it to AutoNumber type now. 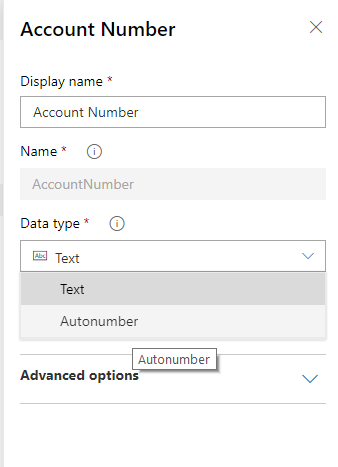 Below I open the OOB Account Number field and set the Data Type from Text to AutoNumber. Short and sweet. Isn’t it? P.S – Only existing text fields could be converted into Auto Number Type. You can off-course create a new Auto Number Type field. Author Nishant RanaPosted on March 23, 2019 Categories Microsoft Dynamics 3652 Comments on How to change Dynamics 365 CRM web interface from UCI to Classic version? While implementing integration packages between XML and Dynamics 365 CE, we had a requirement which required us to write a Script Component (custom code) in Data Flow task to check the status of a record in CRM and based on the value of it take appropriate action. The initial thought was to create a user-defined variable and update the variable in the Script Component and use its value inside a new Derived Column and further in the CRM Destination Component. However, to our surprise, although we can see the variable’s value being updated within Script Component while debugging, the same was not being reflected in the Derived Column and the Destination Component in that Data Flow task. But within the next Script task of that Control Flow, we were getting the updated value. The data flow task reads the above XML file and within Script Component it sets the value of fullname variable and we are putting its value within a Derived Column. SQL Server Destination is inserting all the values into a SQL table. It is still showing the default value. Now within the Script Task in the control flow, we are using a message box to show the value of that variable. The reason for the above problem is SSIS package variables does not update during the execution of the data flow task. Those variables get updated once the Data flow task finishes. Therefore, we cannot use the updated value of the variable during the execution of a dataflow task. Even though you could change the variable values within pre-execution or post-execution methods, it only takes effect on the value of the variable after the execution of the data flow task. So here instead of using the User Defined Variable, we used the Output column of the Script Component. And we set the same inside the script editor. CRM is a very versatile tool that’s often used for B2B sales and all its aspects, including tracking opportunities, leads, contracts, consolidating collaterals, documents and keeping contacts, tasks and events under one platform. One of the most-overlooked essentials in B2B is the sales proposal process. But a timely CPQ, or Configure, Price, Quote software built in right on your CRM can give you that boost you’ve never had. Thinking of adding CPQ to CRM? Consider these 7 elements to get the best system for your B2B needs. Have an SSO, or Single Sign On to make everything easy for you and your users. Can you use templates? This can speed up the process of generating new business and growing your company. Analytics and Sales Reporting solidify the objectives and gives you something to aim for. Integrations free up invaluable hours of your time by automating the apps you use for B2B. Full support for your kind of business, and one that can give you the right CPQ from start to finish. Value and scalability so you won’t have to pay more than what’s necessary. These days, it’s all about flexible pricing and zero annual licenses. Last but not the least, you’ll need product flexibility that can adapt with the ever-changing B2B landscape. Why Will You Need Single Sign On? At first glance, having an SSO will mean a safer and more secure platform than without, but the biggest benefit you can take from this is complete accessibility. Sales tools must be visible and easy to get into so you and your staff can use it more. Plus, your CRM will be on the same platform as your tools, including your proposal. In short, you’ll have the power to distribute, approve, create and collaborate on the proposal you’re working in one easy-to-use system that’s controlled by a single SSO, eliminating the need to install multiple software. Are Templates Really That Important? Proposals can mean the difference between landing your dream job and being stuck in your current situation. You’ll need a professional, high quality, detailed and engaging proposal or else it will get sent to where the sun doesn’t shine. Templates can get you that stunning proposal quickly and consistently. Sales quotes won’t have to be done from scratch, thereby saving you time and effort. For business proposal templates that win deals, take a look at https://qwilr.com/templates/business-proposal-template/ and customize accordingly. The end result? Cleaner, more professional proposals that show the client you’re really serious about your job. Automation and pre-filled templates can bring you there sooner than one without. Sales processes are mainly made up of two parts- the sale itself and afterwards, the reporting. Metrics are there to be seen and analyzed so you can do better on your proposals the next time around. Real-time monitoring on the most important sales aspects mean you’ll be able to target areas of improvements to get better results the next time around. When you learn how to read the data you’ll be more equipped to make the necessary adjustments for improved success. This is true of CPQ, CRM and A/B testing as well. In the world of fast-paced B2B, the quicker you can point leads to your sales team, the greater the chances of turning a profit. Automated proposal software integrated into your CRM platform is one of the best ways to close that gap. For example, you can use Zapier to connect to Microsoft Dynamics (on version 8 and above) and Qwilr with up to 20 unique configurations. Or, have the Microsoft Dynamics CRM tied to Qwilr easily and without having to input a single line of coding. Here’s how the process works. Zapier connected to Qwilr supports the CRM account with automatic lead updates. Your sales team will know almost in real-time if there’s a possible lead they should follow. That said, it’s only a matter of time before your sales team becomes a well-oiled machine, nurturing proposals and getting more sales and profits. You will need a CPQ that offers support for software development, maintenance and management. Free up all your time, concentrate on proposals and work on leads instead of having to do system troubleshooting. B2B sales, mergers and growth can happen in the blink of an eye, and for that reason you will need a CPQ system that can keep pace. Moreover, while a good bargain is appealing, an invaluable partner is better for long-term success. Being able to spread winning bundles and create them via templates is one of the must-have features for CRMs as a whole. CPQ will make your sales team work as one even if they’re not all on the same office, area or location.